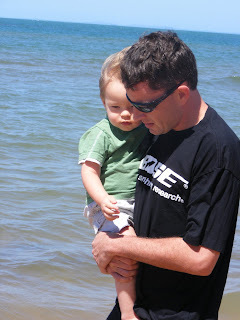 I love this photo... took it on Sunday when we were at the beach... it's such a great photo of a boy and his dad.... still struggling to remember that that dad is my baby brother... he's getting all grown up now. Caiden is slowly getting used to us... James works nights, so the kids are usually asleep before he goes... last night there was a mix up, and the monitor wasn't on... I woke at 1am, realised I hadn't heard him, and checked on him... he was snoring loudly, they both were! Natalie, of course, is a bit rough with Caiden, he is invading her space after all... didn't help that she's had conjunctivitis for the last week - thanks dad, he had it for a few days before she did, didn't say anything! Still school holidays here, so I promised the kids some scrappy time when Nat wakes this afternoon... we've just got back from a trip to two scrappin chicks, which is relocating - 40% off is an awesome savings, and I bought a couple of paper racks to put my cardstock in, too. Got some flock, too, looking forward to playing with that! !